The American Cavy Breeders Association recognizes 13 distinct guinea pig breeds. Most breeds come with a variety of markings and colors, making each individual guinea pig unique unto himself. Unlike size, which is fairly homogeneous, guinea pig coats are diverse. Coat designs and coloration are generally categorized into four varieties. 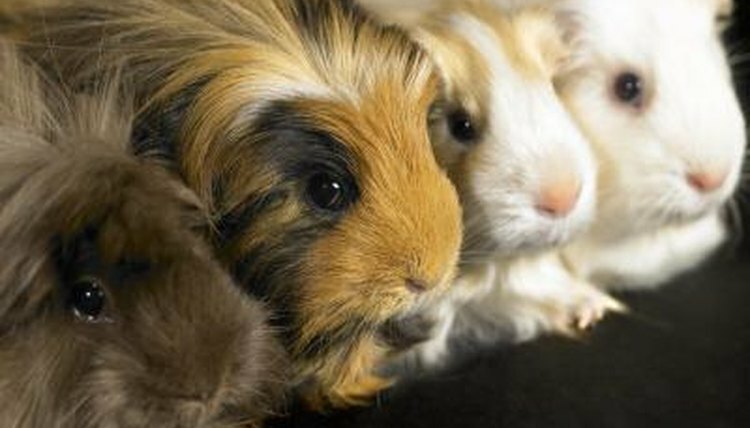 Adult guinea pigs of any breed are relatively the same size. Full-grown females weigh between 1 1/2 to 2 pounds while adult males can weigh anywhere between 2 and 2 1/2 pounds. As for length, mature guinea pigs measure between 8 and 12 inches long. Guinea pigs with marked coats are predominately white with a different, definitive color pattern. No flecking or random highlights here. Marked guinea pigs have solid swaths of colors like white, black and red. The silkie breed’s long, dense fur can come in the marked variety. The agouti coat is commonly found in wild guinea pigs. The coat’s varying bands of color and flecked appearance works to camouflage them from prey in the wild. Common colors found in agouti coats are buff, golden brown, red, brown, dark brown and black. This pattern is commonly found in the multicolored, tufted Abyssinian. The self variety of guinea pig is one solid color with no other markings or pattern. The colors are a nearly literal rainbow and can include beige, black, chocolate, cream, lilac, red, red-eyed orange and white. American guinea pigs, one of the most popular varieties, are often of the smooth, solid-colored self variety. Solid guinea pigs are similar to the self variety as they are also a solid color with no definitive markings or pattern. However, these buddies do have random, borderless patterns of up to two colors that blend together to create one predominate shade of color. These patterns include brindle, dilute solid -- different hues of the same color -- golden solid, roan -- white hairs mixed with two other colors such as black and red -- as well as the final shade: silver.